Since I have no husband or children to keep well-fed and happy, I assume that Wartime Canada wouldn’t object to my personal diet of Halloween candy, coffee and cheese. They obviously don’t care if I’m happy when I get to the dinner table, so they won’t mind if I just snarf down a Snickers bar while lounging on the sofa. Thank goodness I’m too old for Cod-Liver Oil. Why am I shopping from a 60 year old shopping list? And, after a decade away from Canadian grocery stores, toaster strudels and Oreos are calling to me from the aisles like sugary sirens of doom. That’s why. Then, my Grandma mentioned that during the war years, they used to send eggs from their farm in Saskatchewan to their relatives in the UK, nestled in bags of oatmeal. Eggs weren’t as scarce here, especially if you lived on a farm. Brits could have 1 fresh egg per week. Canadians got 5. Taking a closer look, I discovered that rationed Canadians had access to at least twice as much, sometimes three times as much of any given item. Except for tea. British rations allowed for twice as much tea. Someone in the British Home Office knew the priorities of their citizens. 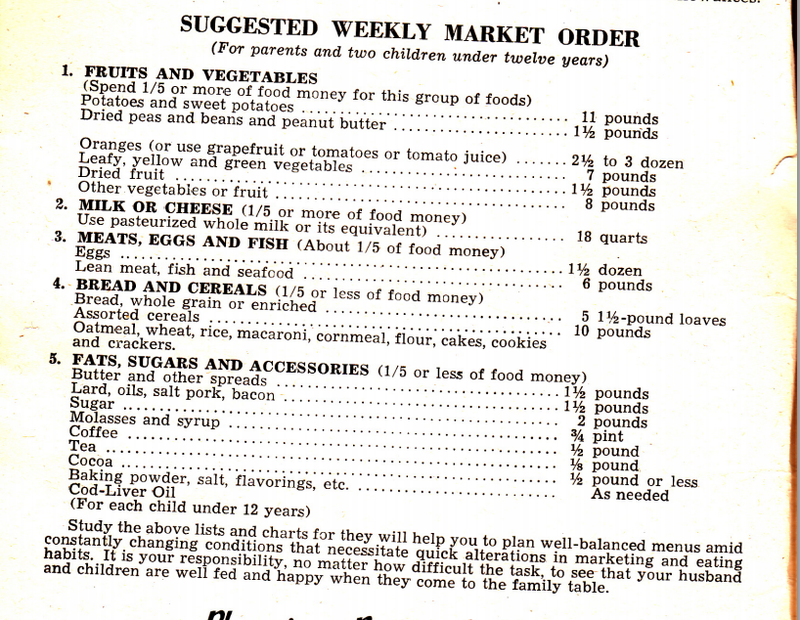 So if you ever hear a Canadian and a Brit reminiscing about the hardships of rationing during the war, I’d save most of my sympathies for the one who had to eat powdered eggs, and only got 1/4 of a pound of bacon every week. I took the shopping list above, divided everything by 3 or 4 (whatever was easiest to divide), since the original list is for a family of four. I thought it looked like a decent amount of food. It’s a serious heap-ton of food. This is supposed to feed 1 adult for 1 week, but it’s easily 4 times as much as I usually buy. (And yet, surprisingly, it’s wasn’t much more expensive.) 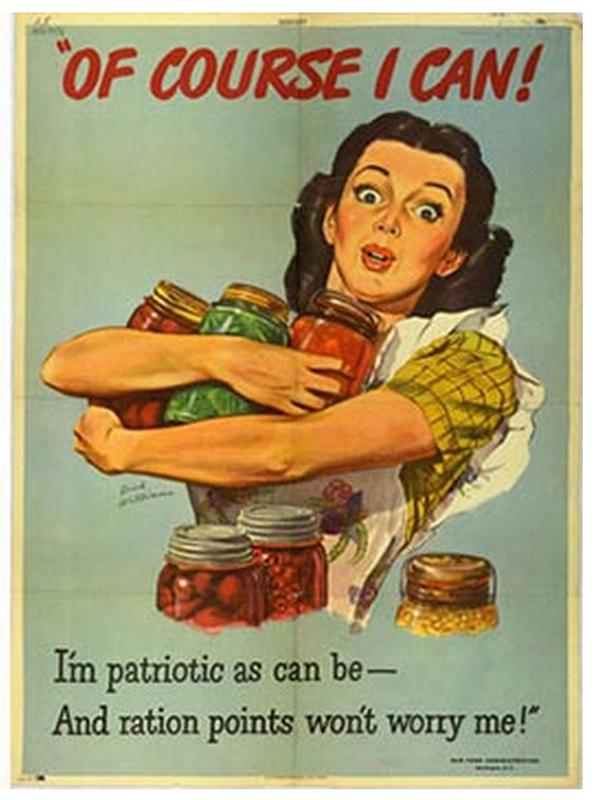 Which made me wonder – if this was the rationed amount, how much were Canadians eating before the war? I can’t eat all this in a week. 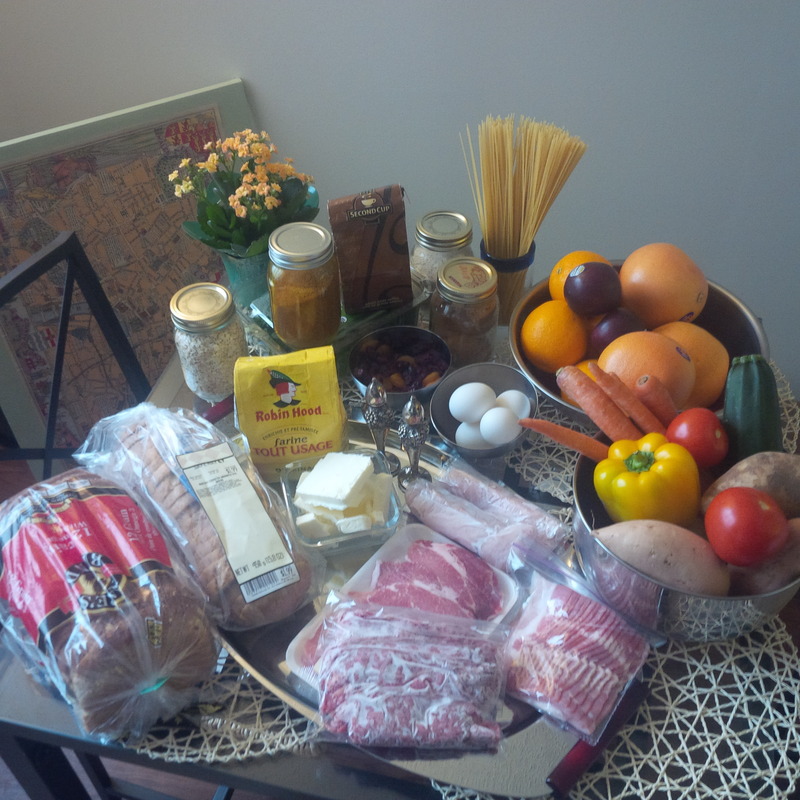 I forgot to include the giant 4 litre jug of milk and 2 oz of cocoa in the photo. (There’s a pile of spinach leaves hiding under the jar of brown sugar, just in case you were thinking there wasn’t much greenery in the mix). I also kept the flowers on table, to show my Mom that I haven’t killed them yet. And you’ll notice there are no Oreos. Which is too bad, since I now have a giant jug of milk to dip them in. My house is a strange place to be on a Friday night. I’ve never seen the appeal in going out and whooping it up, just because it’s Friday, (The fact that I just used the phrase “whooping it up” probably already tells you so much more than you need to know), but once in a while, I feel like I should at least acknowledge the fact that it’s Friday night. Sorry…let me pause here. I also feel like I should acknowledge the fact that I haven’t posted in over a month. So let’s just get that cleared up right now. I was on holiday…and now I’m back from my holiday with lots of things to say…but I’ve discovered that blog posts take so much longer to write when I actually think about what I’m writing. #1. I loved gliding down the empty aisles using my shopping cart as a giant cumbersome scooter, with my midriff balanced on the handlebar. It’s best to do this in the cereal aisle, not the jam-jar or garden rake aisles. Because, you know, safety first and all that. #2. People shopping at midnight buy some weird stuff. I liked trying to come up with stories that would explain why the middle-age woman in front of me was buying baby powder, jumper cables, and a can of peanuts…or why the 20-something man behind me was buying 3 bags of dried lentils and a box of toaster strudel. This where you, and the quiz, come in. As I mentioned earlier, I like to at least acknowledge that it’s Friday night. I feel like I should do something different. I should learn something new…or better yet, I should learn something old. I should resurrect some long-forgotten skill of my ancestors. Like the Friday night that this happened. 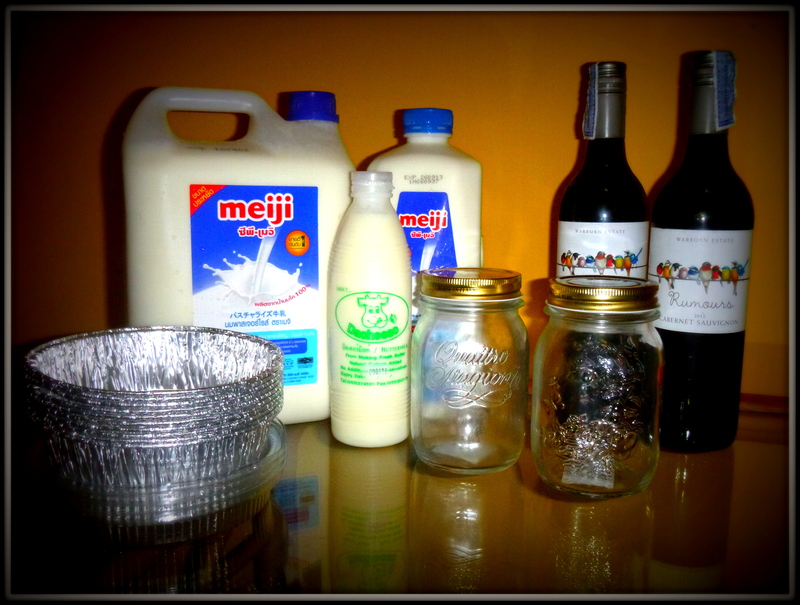 In case the picture isn’t clear, that’s 7 litres of milk, 1/2 a litre of buttermilk, 2 bottles of wine, 2 mason jars and a stack of disposable metal bowls. What’s happening at my cottage tonight? Leave your guesses in the comments below! Today was a good day. After class, I spent a couple of hours in a lovely coffee shop sipping hot chocolate and diving into an assignment that’s interesting, but challenging. It’s a phonological examination of S’gaw Karen, a Tibeto-Burman language. Most of what I did on it today went smoothly, but I did come across a few sounds that were unrecognizable to my ears, and I just couldn’t figure out how to transcribe them. I’ll have another go at it tomorrow. After tucking my work away for the day, I hopped on my bike and headed out on the open road to run a few errands. By the time I got home, the sun was just thinking about setting behind the mountain, and the night market near my place was in full swing. I wandered through and found some new (and deliciously spicy) things to try for dinner, AND a vendor selling my Korean snacky nemesis: the fiendishly deceptive red-bean fish. It’s a little cake shaped like a fish, and the cake is hot and delicious, and the aroma is divine…but when you bite into it, it’s full of nasty, purple, thick red-bean paste. However, the vendor here at my market didn’t just stop at bean paste – he offered chocolate, vanilla, blueberry and strawberry fillings!! What a sweet surprise. After making my way home with dinner (and chocolate fish) in tow, I settled in to catch up on some new videos posted to BoingBoing.net and laughed out loud at the Swedish Chef (of muppet fame) making popcorn shrimp. While I was watching the videos, Thai and Prairie time zones eventually came into propitious alignment and I called my folks. I had a nice chat with Mom, Dad and Gramma, and now that I’ve told you all about my day, it’s bedtime. Prefer email? Sign up here!